By combining a DPextend and a DPadapt module, it is possible to reach cable runs of up to 45m, with no additional power supplies required. Exploit the power of the ImageDP4 DisplayPort outputs to provide long cable runs and support for legacy DVI monitors. The Datapath DPextend module allows the DisplayPort outputs of the Datapath ImageDP4 video graphics card to drive resolutions of up to 2560x1600 x60Hz over 40m into a native DisplayPort monitor. The DPextend is entirely powered from the ImageDP4 graphics card output connectors, provided that Datapath DisplayPort cables are used. 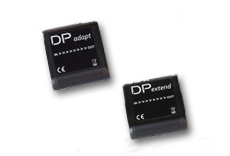 The DPextend also compensates for voltage losses in the cables to allow it to additionally forward power to a DPadapt module for ultimate conversion to DVI. The Datapath DPadapt module is an active DisplayPort to DVI converter which allows the Datapath ImageDP4 graphics card to drive legacy single-link DVI monitors at up to 165 MP/s. Unlike other DisplayPort to DVI converters which have short, fixed DisplayPort connections, the DPadapt can accept a long input cable, allowing it to exploit the improved cable driving performance of the DisplayPort signal standard. Using a 20m Datapath DisplayPort cable, and a standard 5m DVI output cable, a 25m run the DVI monitor is possible - all powered over the Datapath cable from the Datapath ImageDP4 video graphics card. * Requires Datapath DisplayPort cable with power connection.